"If education is always to be conceived along the same antiquated lines of a mere transmission of knowledge, there is little to be hoped from it in the bettering of man's future"
The phrase “concrete to abstract” is heard frequently in the Montessori community. In fact, I've read many Montessori progress reports that state that a child is not yet working abstractly or is still using concrete materials. But what exactly does that mean? The phrase can be rather ambiguous, especially to a new Montessori teacher or parent who may have little working knowledge of Montessori terms and practices. The objective of Montessori is to develop the concept first. By using concrete materials during the early, sensitive years, the Montessori child can learn the basic concepts of mathematics and language. Montessori students use concrete hands-on learning materials that make abstract concepts more clear. Lessons and activities are introduced simply and concretely in the early years and are reintroduced several times during the following years at increasing degrees of abstraction and complexity. All of the materials in the Montessori classroom have been specifically designed to attract the interest of the student, while at the same time teaching an important concept. The purpose of each material is to isolate a certain concept the child is bound to discover. Montessori believed that “what the hand does, the mind remembers”. Concrete materials make concepts real, and therefore easily internalized. The student works abstractly (paper and pencil) when he or she has internalized the pattern and no longer needs the Montessori material. Maria Montessori believed that all humans are born with a “mathematical mind”. From the beginning, the students are introduced to mathematical concepts in concrete form. The use of concrete materials to learn abstract concepts and operations is fundamental to the development of the mathematical mind in the Montessori classroom as the materials represent abstract ideas. The materials can be felt and manipulated so that the hand is always involved in the learning process. This approach to math is logical, clear and extremely effective. It allows the students to internalize math skills by using concrete materials and progressing at their own pace toward abstract concepts. Students understand and develop a solid foundation in mathematics. Later, as they master the concrete they begin to move to the abstract, where the child begins to solve problems with paper and pencil while still working with the materials. Geometry too, relies on the concreteness of the materials. Traditionally, geometry is taught as an abstract series of rules, theorems, and propositions meant to be memorized by the student. Maria Montessori saw geometry as firmly rooted in reality. Her geometry curriculum uses concrete, sensorial experimentation that lead students to concepts through concrete research. The focus of the geometry work is not as dependent on the result as it is by the work the student has done to achieve the result. Concrete materials are not just used for math and geometry. The practical life activities in the Montessori preschool not only provide self-confidence and independence, but helps with concentration and memory which leads to more abstract learning in math and reading. Elementary students use concrete grammar symbols to demonstrate the parts of speech. Once they have mastered these, they move on to more abstract grammar work with the grammar boxes and sentence analysis. Timelines are another concrete material in the Montessori classroom. They are a concrete, linear representation of history. The materials found in the Montessori classroom play an important part in the development of the child. They provide a way for children to construct their own reality and awareness by presenting it first concretely and allowing the children to manipulate and discover the next level of abstraction. © North American Montessori Center - originally posted in its entirety at Montessori Teacher Training on Tuesday, July 15, 2008.
why we have 1-10 numbers on multiplication board? anybody know the answer? 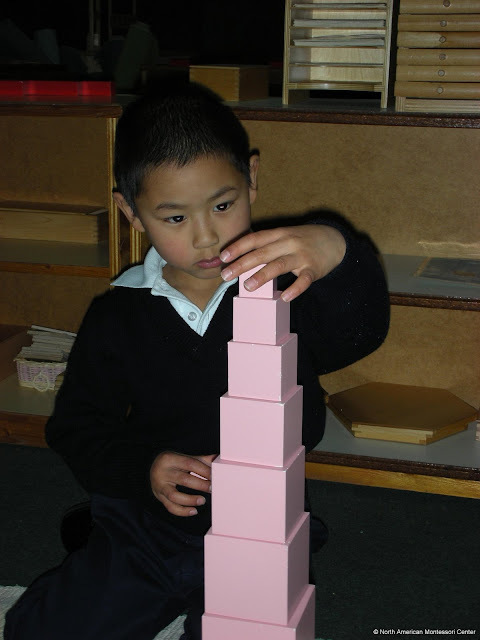 The Montessori math materials are built around the decimal, or base ten, numeral system. This concept is first introduced with the Montessori sensorial materials. The Pink tower is a set of 10 pink cubes in graduated increments beginning with 1 cm3 to 10cm3. The Red Rods and Broad Stair also have 10 pieces, with the Red Rods increasing incrementally in length from 10 cm to 100 cm and the Broad Stair increasing incrementally in width from 1 cm to 10 cm. Dr. Montessori believed that by making students aware of the number ten through sensorial exploration, they would be better prepared to work in a base ten, decimal system mathematically. This is proven again by the Golden Bead material, which introduces 1 unit, the 10-bar, 100-square, and 1000 cube. The numbers 1-10 on the multiplication board correspond with what the children have already explored sensorially using the Montessori Bead Cabinet, where children have explored linear counting from 1-1000. The multiplication board is a more concrete visualization of the 1-10 multiplication tables, and demonstrates that 10 x 10 forms a perfect square. Zero would not be included since anything multiplied by zero is zero.